see attached video recording. I have set auto refresh to 2 seconds. I expect that the query is re-executed every 2 seconds. However, the query is not automatically re-executed. Note: Also, could the forum please be upgraded to allow update of screenrecordings (mp4 format)? Should work now. Thanks for the good hint. To answer your initial question: The auto-refresh feature is intentionally only for the data grid, the process list and some other grids, where Heidi has full control over the query executed in the back. The query editors can have quite dangerous commands, such as DROP and DELETE and whatever. I have also attached the recorded video, to illustrate what I did. Note: thanks for supporting mp4 format! Extra remark: I had to struggle to limit the file to 2MB... maybe file size could be increased? 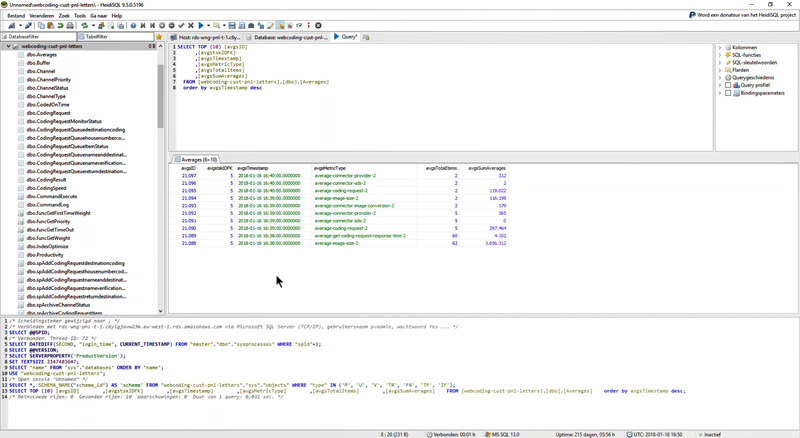 @mgroen What Anse tries to explain is that the Query tab is a free text editor where you can type any kind of SQL commands. Sure, you can type a SELECT one, but absolutely nothing prevents you from typing any other valid query or command, such as DELETE FROM customer or EXEC sp_wipe_out_data. For me the requested feature looks too dangerous to be implemented and... not really useful. HeidiSQL is a tool for DBAs and professionals knowing what they are doing. Whether this is "too dangerous" should be left to the user. I have been looking for this for the last year !!!!! THANKS ! If that's still of interest then please make an issue request in the bugtracker, and please follow what the issue template says.